A White House spokesperson and two members of U.S. President Donald Trump's cabinet suggested Wednesday that Canada and Mexico might escape new tariffs on steel and aluminum. White House spokesperson Sarah Huckabee Sanders said Canada and Mexico might get a "carve-out" for reasons of national security, and she said other allies might also ask for one, on a case-by-case basis. Earlier Wednesday, Commerce Secretary Wilbur Ross told reporters that Trump has "indicated a degree of flexibility." "If we can work something out with Canada and Mexico they will be exempted. It's not inconceivable that others could be exempted on a similar basis," Ross said. The formal tariff announcement is expected Thursday afternoon. Hawkish White House trade adviser Peter Navarro suggested the exemption would come with a catch. He told Fox Business Channel that, at 3:30 p.m. ET, surrounded by steelworkers in the Oval Office, Trump will sign proclamations that impose tariffs that kick in within 15 to 30 days on most countries. He suggested tariffs could still hit Canada and Mexico later: "The proclamation will have a clause that does not impose these tariffs immediately, on Canada and Mexico. It's going to give us the opportunity to negotiate a great [NAFTA] deal for this country. And if we get that, all's good with Canada and Mexico." Treasury Secretary Steven Mnuchin said the administration was "definitely going to end up" with the across-the-board tariffs Trump is seeking — 25 per cent on steel imports, 10 per cent on aluminum. "But, again, there will be a mechanism where, to the extent that the president wants to give waivers, the president can do that," he told Fox Business. Speaking to reporters in Toronto before Sanders made her comments on exemptions, Prime Minister Justin Trudeau said the government would defend Canadian workers in the steel and aluminum industries, and potentially the auto industry, if Trump moves ahead on tariffs. "We know from experience that we need to wait and see what this president will actually do," Trudeau said. U.S. business leaders expressed alarm about the potential economic fallout from the tariffs Trump is pursuing, with the president and CEO of the U.S. Chamber of Commerce raising the spectre of a global trade war. That scenario, Tom Donohue said, would risk the economic momentum from the GOP tax cuts and Trump's rollback of regulations. "We urge the administration to take this risk seriously," he said, and opt against the tariffs. 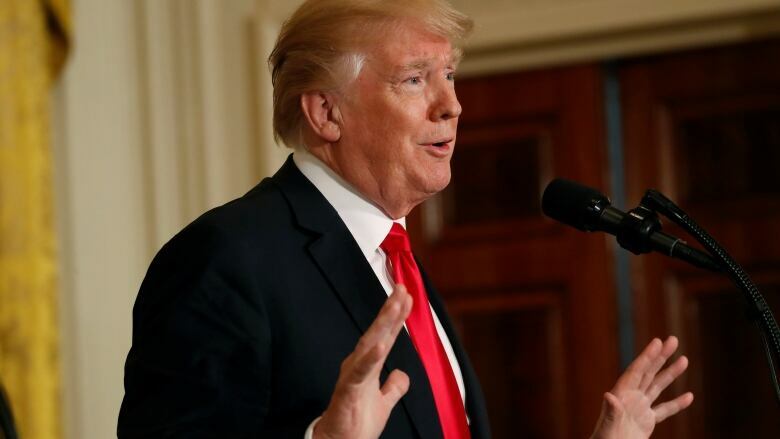 Trump has said they're needed to preserve American industries and protect national security, but he also has tried to use them as leverage in the current talks to revise the North American Free Trade Agreement. "We're cautiously optimistic on NAFTA," Mnuchin said. "This is part of those discussions. But assuming we get the new NAFTA deal done, they will be exempted." White House adviser Jared Kushner and staff from the State Department and National Security Council planned to meet Wednesday with Mexico's president and foreign minister in Mexico City. Trump also signalled other trade actions could be in the works. In a new tweet, the president said the "U.S. is acting swiftly on Intellectual Property theft." His trade representative is investigating whether China's rules are "unreasonable or discriminatory" to American business. Findings from that review, and possible reflationary actions, are expected to be announced in the coming weeks. Congressional Republicans and industry groups, warning of the economic fallout, are pressing the president to narrow his plan, but he appears unmoved. "Trade wars aren't so bad," he said Tuesday, adding that the U.S. has long been "mistreated" in trade deals. Hours later, Trump economic adviser Gary Cohn, who has opposed the tariffs, announced he would be leaving his job at the White House. House Speaker Paul Ryan called for a "more surgical approach" that would help avert a trade war. "We are urging caution," Senate Majority Leader Mitch McConnell said. Asked about the calls from those leaders, Ross said the White House was "trying to do a surgical approach."